Olaf the Snow Man knows that if he wants to survive the summer, then he'll need to hydrate. And so will you! This Disney Frozen Olaf the Snow Man Happy 20 oz. Tritan Water Bottle is colored blue overall and features a fun image of the happy and dancing Olaf. 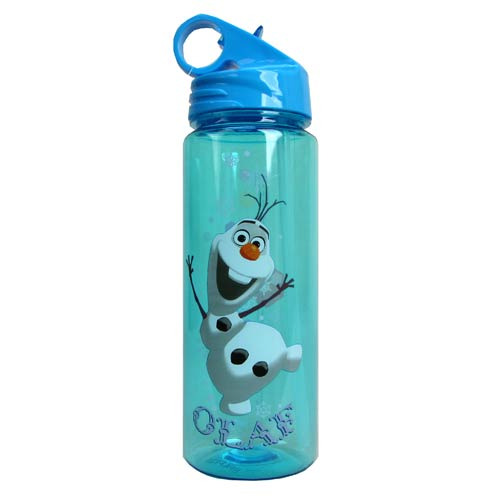 Perfect for Disney Frozen fans, this great water bottle will help quench your thirst when it gets hot, and holds up to 20 ounces of liquid. Hand wash only. Not dishwasher safe. Do not microwave. Measures 9 1/2-inches tall. Ages 14 and up.